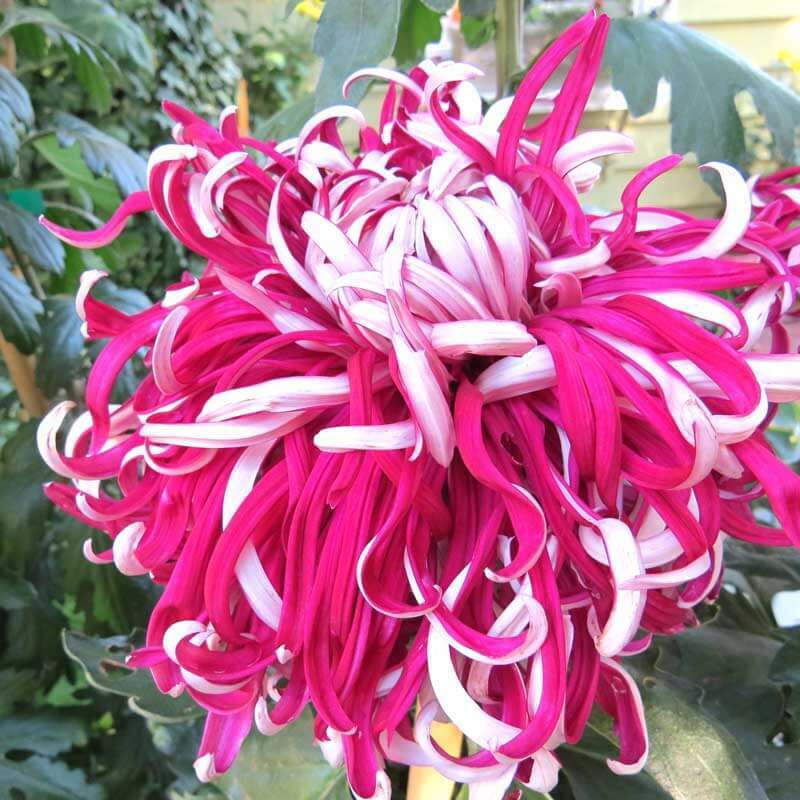 Are you familiar with those huge, larger-than-life chrysanthemums your grandmother or grandfather grew? Those are show mums, grown specifically for their beauty, bragging rights, or for competitive chrysanthemum exhibits. With a little help and direction, you too can grow these mums worthy of a fair exhibit. Show mum blooms have fantastic shapes and colors that can often appear from another world. 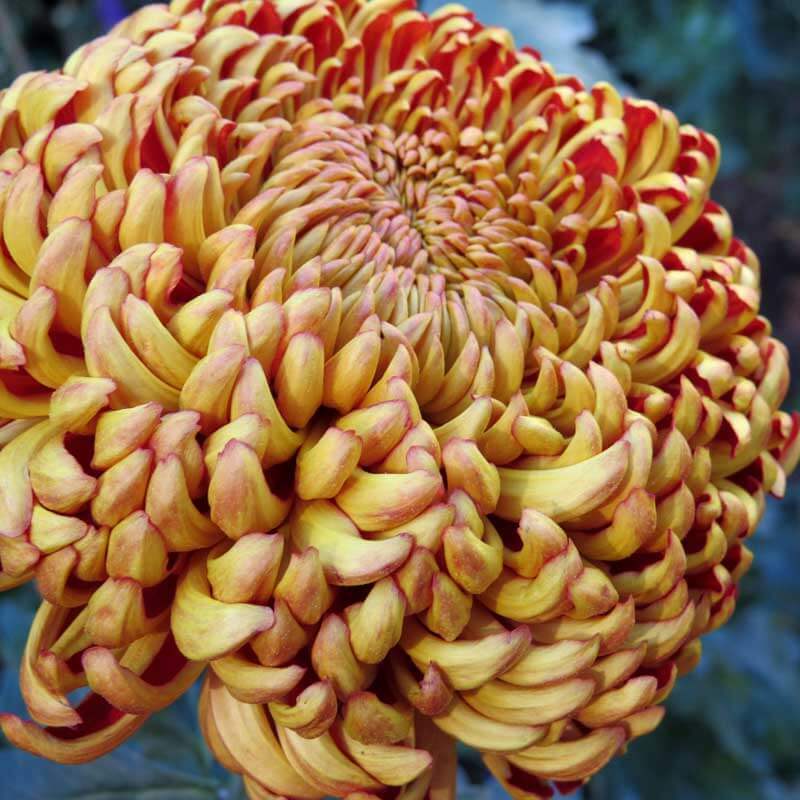 The National Chrysanthemum Society, USA groups these bodacious chrysanthemum blooms into classes, divided into 13 different bloom forms. Stay with me here. The groups are Class 1 Irregular Incurve; Class 2 Reflex; Class 3 Regular Incurve; Class 4 Decorative; Class 5 Intermediate Incurve; Class 6 Pompon; Class 7 Single and Semi-Double; Class 8 Anemone; Class 9 Spoon; Class 10 Quill; Class 11 Spider; Class 12 Brush or Thistle; and Class 13 Unclassified or Exotic. Yet growing show mums is really more than just creating blue ribbons for the fair. Growing these mums can also be therapeutic. As with any type of therapy, there is a learning curve. Here is the good news. The Triangle area has a mum mentoring society. 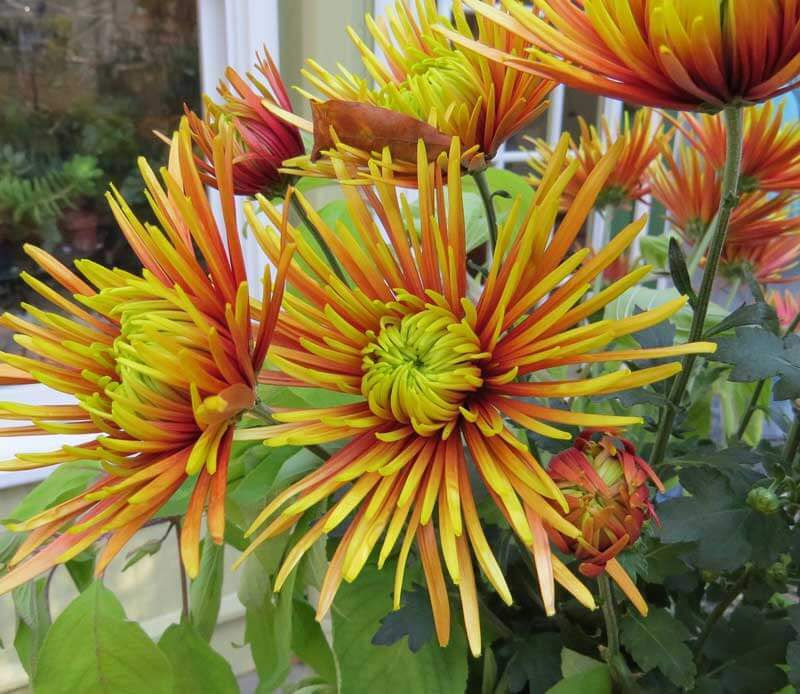 Raleigh resident, Joan Matthews, has revived the languishing Central Carolina Chrysanthemum Society with fresh members and a whole new level of enthusiasts. Conditions: Provide full sun, good drainage and an optimum pH of 6.5-7.0. These mums also grow well in containers. Hardiness: Grown as an annual, the crowns can be wintered over in a dry location such as a cold frame, porch or in a garage. Or lay them sideways on the ground, covered with a frost cloth. Planting: Plant the largest flowered types as soon as you can in spring after the last frost. Small-flowered types can be planted as late as July. Watering: Watch the water. Mums don’t like wet feet. Fertilizing: Regular use of a high nitrogen and potassium fertilizer will increase flower size and numbers. Flowers and Leaves: For the largest flowers, remove all buds except for the larger central bud, a type of pruning known as disbudding that directs the plant’s energy to flower production. Use stakes for support. Height: These range in size by class from 12-inches high to over five-feet tall. The leaves have a strong chrysanthemum scent. Problems: Watch for aphids and other unwanted pests, and spot treat individual plants to prevent infestation from spreading. Order young plants in the spring (King’s Mums is a mail order source) or get cuttings from other enthusiasts. Joan orders new ones each year, and also takes cuttings from plants she over wintered from the previous year. For better foliage at bloom time, cut back your mums if they are over 10 inches tall on July 4, making sure to leave behind good green foliage below the cuts. For show mums to achieve their full potential size, restrict the branching to 2-4 stems. Lateral cuts will be necessary. Remove all side laterals to keep these branches from robbing the stem and developing buds of energy. Disbudding will also be necessary. Large-flowered types will only reach their full potential if the buds are restricted to one per stem. Remove all but the largest center bud when buds are still very small. The regular use of a high nitrogen and potassium fertilizer will greatly increase the flower size. At planting time, add a 14-14-14 organic fertilizer. After August 1 and until the flower buds show color, add a weekly liquid feeding. Once the buds show color, change to a 10-10-10 fertilizer or use none at all. The Central Carolina Chrysanthemum Society meetings take place at the JC Raulston Arboretum in Raleigh on the third Monday of each month from 12noon—2pm. Guests are welcome. This is a great opportunity to learn about show mums. Contact the club at 919-755-0880 or [email protected]. Featured image Chrysanthemum Heather James Class 3B by Helen Yoest. Helen Yoest, author of several books including her latest, “Good Berry, Bad Berry,” is an award winning garden writer and sustainable gardening caring for her half-acre wildlife habitat, Helen’s Haven.